Individual responses to conditioning differ based on genetics, age, and previous activity level. The advantage of a heart rate monitor is that it gives a continuous reading of the horse's heart rate before, during and after exercise. After the horse's body adapts to each new level of training, the workload is incrementally increased, again with a period of adaptation which is then followed by more intense training. Event specificity - How do you use your horse? Just as a long distance runner's training will differ from the training of a pole vaulter, so will the training of your horse focus on the specific demands of a particular type of event for which the horse is training. This conditioning improves cardiovascular and muscular efficiency and enhances the horse's ability to regulate body temperature while stimulating adaptive changes in the limbs. LSD training builds aerobic endurance and allows the horse to exercise for prolonged periods at a low to moderate intensity. As your horse's fitness training load increases, adjustments need to be made in the feed ration to accommodate increasing physical demands. This is usually accomplished by increasing the grain and decreasing the amount of hay fed. An alternative method of increasing the energy intake is to add fat which is an energy dense food. In addition to increasing energy consumption, it may be necessary to add calcium carbonate to the ration as the grain to hay ratio increases. If your horse begins losing weight during fitness training, it is obvious that the energy content is insufficient for the workload and the amount of feed needs to be increased. If your horse is competing, the feeding regime on that day of the competition can have an enormous effect on the horse's performance. Research indicates that a meal of hay and grain fed approximately 4 hours before the beginning of competition will allow time for stabilization of the glucose and insulin levels before competing. In addition, electrolytes should be given at the same time as the meal since this combination influences the amount of fluid retention in the gut. The fibrous content of the hay and grain stimulates the horse to drink, and and the electrolytes keep the water in the intestine where it is available to replace fluids lost in sweat. How do you know when your horse is "fit?" Researchers with lab equipment have all kinds of ways to measure a horse's fitness, but unfortunately, most of us do not have a lab full of equipment to determine when fitness is reached and then monitor it on an on-going basis. As simple as it may seem, the information that can be gained by monitoring your horse's heart rate is perhaps the best and most practical means of judging work effort. Monitoring the heart rate during exercise and recovery after exercise will give you a clear indication of your horse's fitness. Together, these two heart rates are a means to quantify work effort and, over a period of time, show the progress the horse is making toward fitness. Strenuous workouts or faster running speeds will produce higher heart rates as fitness training takes place, especially in the early days of training. As the horse becomes more fit, the heart rate decreases during exercise, and it also goes down more quickly following exercise. By keeping records of the heart rates, both during exercise and during recovery, over a period of time, you will be able to compare the changing heart rates as your horse becomes more fit. You can determine the heart rate by palpitating an arterial pulse, listening to the heart sounds with a stethoscope or by using a heart rate monitor. Since the heart rate drops rapidly after exercise ends, palpation or auscultation of the heart rate by using a stethoscope will not accurately reflect the heart rate during exercise. The advantage of a heart rate monitor is that it gives a continuous reading of the horse's heart rate before, during and after exercise. If you do not care to invest in a heart monitor, you can still assess your horse's heart rate before and after exercise. In any case, when you are comparing heart rates to determine fitness, you will need to standardize your workout program to make sure the heart rate comparisons are valid. 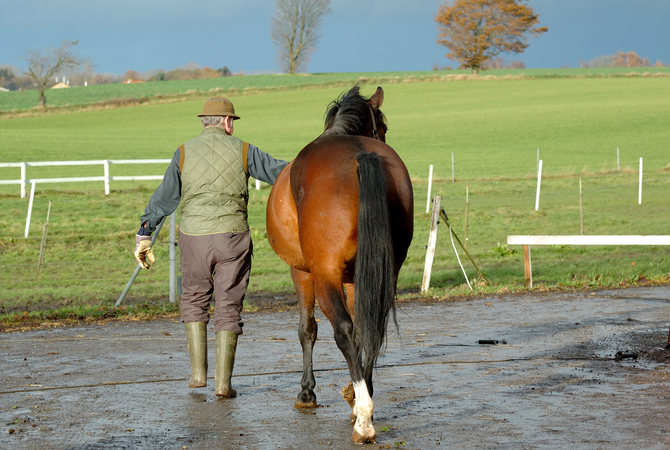 Do this by making sure the horse's work covers the same distance, terrain, footing, environmental conditions, etc. each time you do your comparisons. The measurement of recovery heart rate is considered the best option for assessing the horse's capacity to adapt to the training load. Take the horse's heart rate at 2, 5 and 10 minutes after completion of your standardized exercise program. In a well-conditioned horse, the heart rate will be around 60 beats per minute after 10 minutes of recovery even following strenuous workouts. If the heart rate is 72 to 80 beats per minute or more, it may indicate that the work effort is beyond the horse's current level of fitness. Heart rate is sensitive to a variety of environmental factors including temperature, work surface, excitement level. Exercise heart rates increase during hot weather, or on more yielding surfaces, and also show slower recovery rates. Illness and lameness can also affect the horse's heart rate, so if the heart rate is elevated above normal after the bout of standardized exercise, the horse should be evaluated further. At one time, the respiratory rate was considered to be an indicator of fitness, but research shows that, although the respiratory system plays an important role in thermo regulation during and following exercise, it is more reflective of heat buildup and dissipation than adaptation to training. Another principle of conditioning is that when a horse is taken out of training, it loses fitness. This loss of fitness is known as detraining, and the rate at which cardiovascular fitness, musculoskeletal strength and suppleness are lost determines the time required to recondition the horse once it is back on the fitness conditioning program. Minimal loss of fitness occurs when a horse is out of training for a month or less, especially if it has been training for several months prior. In such cases, the workload should be reintroduced gradually over a period of several days before resuming the previous work schedule, especially if an injury is involved. If the layoff is longer than a month, greater losses of cardiovascular condition and musculoskeletal strength will occur. As a rule of thumb, each additional month off beyond the first month of layoff requires a month's reconditioning. It is best to maintain a baseline level of fitness at all times including at the end of the competitive season with cardiovascular workouts twice a week at a reduced intensity and duration. By maintaining a baseline level of fitness, reconditioning will proceed much more rapidly the following season.